You can buy a full toilet-sink combo and replace the toilet you already have, or change the cover of your toilet with something like the Sink Positive, which you can easily install by yourself. Save space and save water all in one. This means you don’t have to waste any wall area on a pedestal sink or a small vanity, and can actually have more space to sit and stretch your legs. This really a great idea, its not only save the toilet spaces and its look trendy too. What if you could pee and shower in the same space? Or, pee while you shower, while sitting on the toilet? Well, if you transform your tiny bathroom into a wet room that includes your toilet within the showering space, you totally can. Depending on how the current bathroom is set up, you might have to tile it up for water use, add a drain in the floor and a little ledge to keep water out of the rest of your home, but overall this isn’t too difficult to manage. 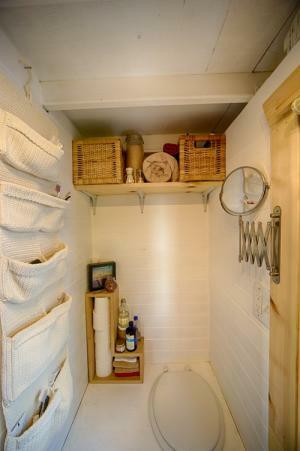 A tiny bathroom still comes with walls—so use height to your advantage by storing items high up instead of close to the floor. Put common, often-used items within reach, and stuff you use more rarely higher up, on shelves. If you’re worried about hitting your head on hard bins, you can always hang soft mesh, plastic and fabric organizers for the things you use the most. Different-sized pockets will hold on to most items, including your hair dryer! And you don’t need to hang it on the door either—hammer a nail in the wall and put your organizer somewhere practical for you. 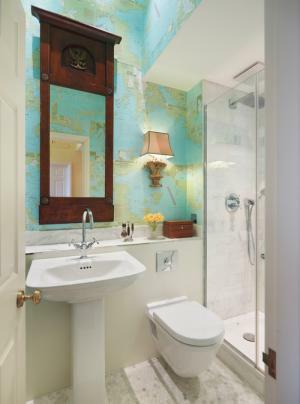 If your bathroom is small but height enough, you may apply this idea to decorate your bathroom. You don’t need a ton of space to wash your hands—sometimes just a little area is enough. If you absolutely want a sink that’s separate from, say, the toilet (see above), you can opt for a narrow sink instead of a full-sized one. 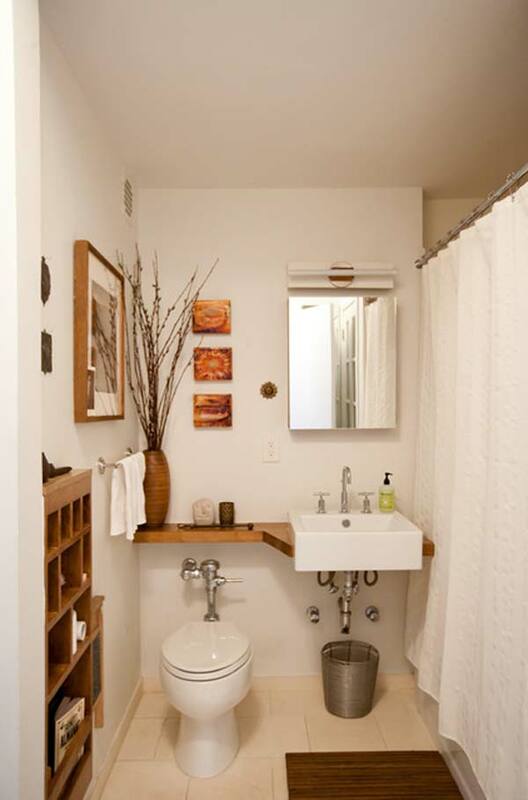 For more floor space, you can purchase a floating sink with a small cabinet space underneath to hide the pipes. 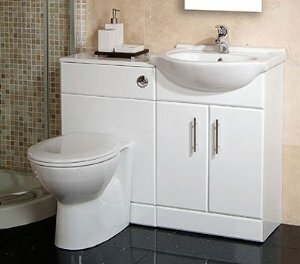 Otherwise, a traditional but narrow-sized sink will do the trick, as long as you get the narrow vanity to go with it. A sink is just for you to washing your hands and face, brushing your teeth. So you no need to buy a full-sized one as it just make your bathroom become cramped. 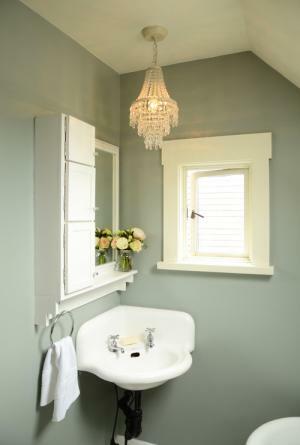 Although you need some space for a tub, you certainly don’t need a palatial bathroom to fit one in. With the right process, you can find a tub that’ll fit into your bathroom, and nice spa tubs at that. 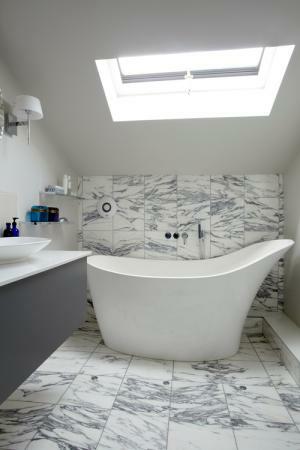 If you have a weirdly shaped bathroom, like in an attic or under an eave, you can place the tub under it to save space. All you need is to bend a little when you get it, but otherwise it means making the best use of the space you have! Don’t disappointed if you wanted to have a bathtub but your bathroom is tiny. Well, you can buy a tiny tub that fits into your existing bathroom. In a tiny bathroom, every inch counts. So if you find yourself severely lacking for space, even the few inches that come with a tankless (or hidden tank) toilet can make all the difference. Removing the tank factor from your toilet makes your toilet sleeker, less noticeable, and definitely less prominent. Whether you chose a tankless model, or one whose tank is hidden in the wall, you’ll have a few more inches for your legs when you sit, and extra space for whatever else you need to do in the bathroom. Do note that tankless toilet is still need access to plumbing, so you can’t simply change its position in the bathroom. But, tankless toilet is not cheap, consider your budget before buying it. 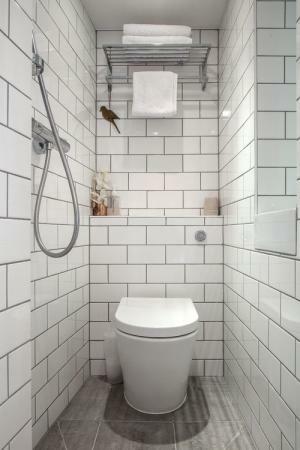 Take full advantage of the space in your tiny bathroom by using the corners. 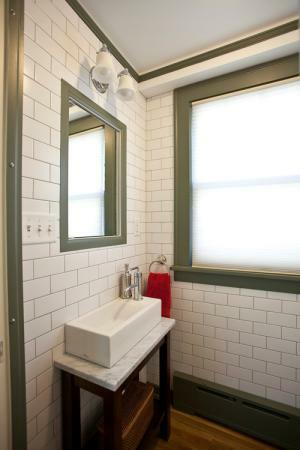 One thing you can do is install a wall-hung or pedestal corner sink to save space on either side of the walls for things like towels, a toilet and maybe a tiny tub. If you’d rather have a larger sink and aren’t interested in the narrow sink option (see above), then maybe the corner sink is for you. They’re practical, you get a full-sized basin, and you save tons of space. You will need to check on your plumbing position before doing it or you may consult a professional plumber to check whether can move the plumbing to where you want. So, don’t upset if your bathroom is tiny, there still have the rescue team out there to solve your problem. Instead of spend your money to hired the interior design or expand the bathroom, you should try the above 7 ideas to do-it-yourself.